TEAM VEGETABLE PRODUCTION STRATEGY THAT COULD MAKE YOU A MILLIONAIRE – A 3 MUST DO! In the land of soaring unemployment rate and underpaid employments as witness in Nigeria, there exist mammoth opportunities for financial liberation in vegetable cultivation through team work. Team work I mean! But not the team work you think. Please come along. inputs alone, plant alone, harvest alone and sell alone with very little rewards whilst carrying the entire burden. This burden involves in cultivation can be shared. How? Our organization have introduced to over 500 rural vegetable farmers in two Southwest states a strategy called the 3 MUST DO. This strategy involves synchronization of activities by the farmers in the same group planting the same vegetable crops. Find below the 3 MUST DO. For a small scale farmer, buying some inputs alone could be too costly and too financially burdensome. For example a 50g of a good hybrid tomato seeds (determinate) ranges between N10, 000 to N40, 000 ($30 to $126) meant to cover almost an acre ceteris paribus. This farmer uses seeds (local varieties) worth of N1000 ($3) for an acre of land before hybrid seed was introduced to him. In addition, he hardly uses any other inputs like fertilizers, pesticide nor fungicide etc. When he witnessed the benefits of embracing modern best practices in vegetable production through our successful demo plot set up in his village, he wishes to go along but the financial requirement of cultivating an acre is too much for him to bear alone. (This is a real case scenario of some of our local farmer trainees). So, we introduced bulk purchase of input together in group of say 8 farmers who could cultivate 3 acres of tomato (or any other vegetable that have broad markets). They bought 150g seeds of a very good but expensive hybrid tomato seeds with each farmer bearing a unit cost of N9, 000 ($27). 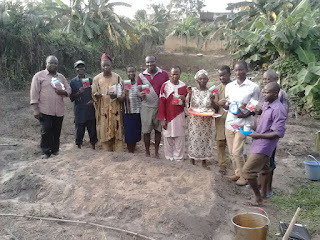 They also bought other inputs such as fertilizers, plant growth regulator, fungicide, insecticide and herbicide together with each farmer having a unit cost of N10,000 ($30). In total, each farmer spent N19, 000 ($57) apart from labour cost which they provided themselves. At the end each farmer planted average of 19g of seeds (5700 seeds count). Being hybrid, they achieved minimum 85% germination and 80% post transplanting performance. This equal 3876 plant stands that would survive at harvest. With a projected yield of min. 10 tons per acre as against 0.5 ton of yield/acre from local varieties, each farmer is expected to produce 3.7 tons or 75 baskets (Hausa basket with average 50kg capacity). If sold at N7, 000 ($22)/basket (Note: the current price is N25, 000/$79) which is the minimum during wet season in Southwest), it is expected to yield gross profit of N525, 000/$1666. Each farmer cost of production is peg at 30% max. of gross profit including the cost of the farmer's labour input. Each farmer is expected to take home net profit of N368, 000/$1,168 (excluding the cost of labour he paid himself) from 1/3 an acre. This is approx. 800% increase from his usual net profit of planting local varieties and carrying the entire burden alone. This is a good case scenario of engaging other like minds when you want to set up your small scale vegetable farm. This reduces your unit cost and share the burden of buying inputs in bulk which would be distributed among group members. Please note that each farmer cultivate his tomato on different farm locations but with good proximity unlike farm estate. They only meet often to discuss challenges and activities outlined. The case of farmers above carried out their nursery set up the same day. This would ensure uniformity in growth, flowering and harvesting. The harvesting of most vegetables isn’t a onetime activity. It could be in many phases. The stress of transportation of relatively small quantity gotten from small scale farm is too stressful and not cost effective. It often forces farmers to sell to villages/local markets where they are ripped off by greedy marketers intending to buy in bulk to transport to major cities’ markets. Engaging in synchronized harvest/transportation enables the farmers to transport to those urban central markets through shared transport cost and as such increasing their profit margins. In addition, engaging in team farming also helps to share experiences and knowledge meant to address any problem faced by any of the members. I hope you enjoy the 3 MUST DO. You can however modify it to suit your local circumstances/conditions. Please make any suggestion to enrich this strategy or ask question as you deem it fit. HYBRID VEGGIES : TEAM VEGETABLE PRODUCTION STRATEGY THAT COULD MAKE YOU A MILLIONAIRE – A 3 MUST DO!